The Brigade of Gurkhas are back in training for Mount Everest, and, acts of God aside, the team is in a strong position to put the first serving Gurkha on the summit. The team, largely unchanged from Gurkha 200 Everest (G200E), has built on the foundations laid in the run up to the 2015 expedition. They have conducted training in the French Alps, Wales and most recently in Scotland. 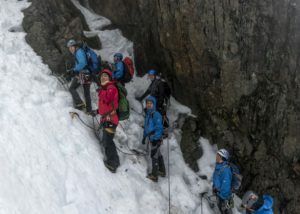 The aim has been to reignite the skills required with a particular focus on exposure at height and technical ability on rock, ice and snow. As with any expedition, a key component to success will be the cohesion of the team, and the training exercises have all allowed the team to strengthen the bonds built in 2015 through climbing and the earthquake. 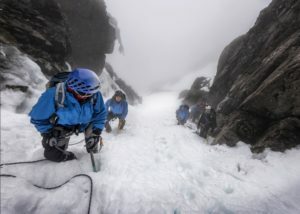 In addition, they have allowed the 4 new members of the team a chance to integrate and develop uniform practices for procedures like crevasse rescue. The Scotland trip in early January was the final exercise prior to our upcoming deployment in late March this year. 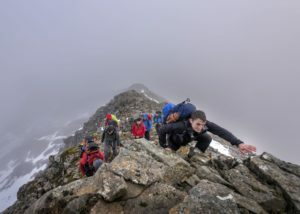 Several ridge routes conducted in small teams allowed them to hone the art of moving together as a roped team, a skill which often causes frustration in novice groups as one ends up dragging the other as the climb changes in nature! 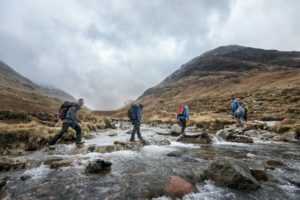 A day in Glen Nevis saw us ascending some tricky rock climbs in summit boots and using ‘fixed lines’ in the same manner as they will be laid out on Everest – a simple but crucial skill. The indoor ‘Ice Factor’ climbing wall, Britain’s only indoor ice climbing venue, was a stone’s throw away from our accommodation, so most days saw the team heading down the road to improve our technical climbing. 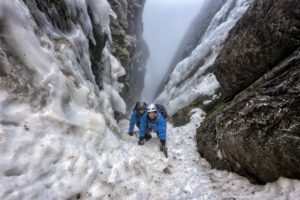 A full day on the ice on one particularly poor weather day saw the team climbing overhanging ice walls and pushing our technical limit far beyond what will be required on the mountain. It is precisely this kind of training that allows us to travel to Nepal next month confident in the team, the personal mountaineering ability and the chance to finally achieve what began 5 years ago. The team are ready and this HQ and the GBA are behind them all the way. We will keep you posted over the coming months on this website and Facebook.